I found my trip over to Salt Spring Island to be many things and the daily phone calls home were a testament to the variety of days I had. The course started with the usual introductions and "tell a little about yourself". Each person said what they do for a living and how they are involved with clay. There was a software designer, a couple of office types and some very well travelled others whose stories would fill the afternoons while I was dishing fresh bruschetta onto local chevre smeared across a crisp bread. I have to say that I really enjoyed sitting in the shade and eating (as I love to do) listening to people talk about clay and life. 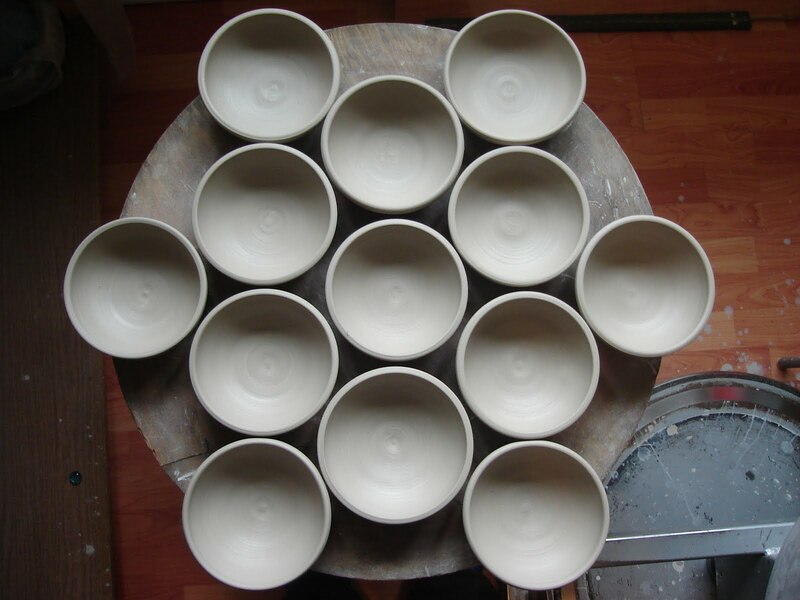 When it was my turn to say something, I introduced myself as a potter who works full time (plus a part time job as a potter, hahahahhaha) about 50 hours a week and that I sell my work at Markets and a gallery and a few coffee shops. Everyone was suitably impressed and ooohhh'd and aaahhh'd that they just can't wait until they retire in a year of two and really go for it. As the days wore on, however, there was a certain amount of distance growing between myself and the group who were all at least 25 years older than I am. It started with the ease with which I throw things. Not just small things but after you have made a zillion pots with care and attention they all get lighter and more pleasing. I was asked to make a set of various shapes and made the assigned work in the morning before we broke for lunch. It was actually a little embarrassing to see others struggling to center their second attempt at "the cylinder" after we came back from the garden lunch break. I was challenged to throw an enclosed donut on the wheel and gave it a try, as I had never made one before, it was exciting. It closed for me and I wet trimmed it and cut it free from the wheel head and picked it up! One of the skills that our instructor was trying to get across was the reduction in water use. Every beginner uses litres of water on each piece because they feel like their skin is sticking to the clay, which of course it is, but this takes a long time to get used to. The plan was to practice using metal or plastic ribs (the shape of a capital "D" cut out of stiff material) on the clay to compress and stretch the clay without using water for the sticking. It was a little ironic though because I will throw all day and have a dry catch bin at 10pm when I call it a day. I was interested in using the Laguna B Mix, Cone 10, as I have never thrown it before and I have heard it is really buttery. It was as soft as they say and I soon realized that the reason you needed to throw with ribs and slip instead of water was that it had a bit less wet strength than my usual Plainsman clay. The other thing that became painfully obvious the morning of the second day, was that it also became rancid over night, as I gagged after dipping my sponge into the throwing water I would be re-using. I have smelled humans decomposing, cadavers full of formaldehyde and necrotic tissue on people who were still very much alive but this powerful black sludge would be proud of it's smell amongst them all. I was camping on the gorgeous property and so was up at 7 and over making breakfast and coffee and reading a pottery book a full hour before the rest of the class would arrive. Once the class was over each day, I would find some more food (glorious food) and sat and read books about pots and potters until I would have to brush my teeth by the light of my cell phone and pump up the air mattress in total darkness as the wind up LED lantern would only last a few minutes with each winding. I learned some really great ideas about how to be a potter in the future, the instructor was 78 and could work just as hard as I could (I'm 32) she walked every day and the food producing part of her garden was the same size as mine and she was replanting for the second go round of peas this year. Her garden was also surrounded by another huge flower garden that would grace any magazine cover that ever took a look! She had retired from her life as an academic from Alaska to Salt Spring in the early '90's and had pursued potting full time, after almost 20 years of potting starting in '72. I tried things that I would have never tried to make because they may or may not be successful and most things need to be dried/soaked/reclaimed and wedged back up by hand if they are terrible. Her magic pugmill was a thing of beauty and I spent three hours on the first afternoon helping the studio assistant re-work the clay from that day. It could really work clay back up and if you got the wet and dry stuff balanced just right the clay was workable. It was however full of crap. I was very surprised how many times everyone was stopping each day to bellow or groan about a chunk of "sh*t" in the clay that was ruining the item they were working on. I didn't figure out of the little black or beige lumps were in the boxed clay or were a part of the pugger or just random bits from the studio. I was also weirded out by the plywood work surfaces that were everywhere, the slightest contact with the sticky wet clay would leave bits of wood in everything. I have a piece of canvas on my wedging table and once a piece is thrown it goes onto a drywall batt (that a new house construction waste pile was kind enough to donate) that has a very strong edge of duct tape. The only bits of junk that end up in my way are tiny (though largely infuriating) bits that break off my sponges. Too many sponge bits and I cut a new synthetic sponge into 4 pieces and throw the old ones into a jar that I donate to whomever wants them. The class and trip were wonderful and I am a better person for going. On one hand I am simply more focused on being a potter and making my work and then selling it, but on the other hand it was quite disappointing that no one else understood that process. The instructor has a pension and all the other classmates were looking at clay as a hobby whereas I see it as the life blood (though quite thick and hard to pump) that is my life. I guess I thought that there would be a kindred spirit feeling there but I ended up leaving two days early with a taste in my mouth that they had all decided that I simply made clay crap that I thought would sell to pay the bills and that there was a decidedly higher meaning in it for them and they were "artists" who made clay work only to suit their whims and no other (dirty) purpose. I had to suggest that the opportunity to sell one's work was a nice way to be able to buy more clay but it seemed 'low' somehow to do so. I had a funny little image in my head while I was there of the "clay artist" buying a box of clay and carrying it to the studio and building something out of it and carefully firing and glazing it and being excited with the result and then walking out to the backyard and standing over a huge pit that they had dug and throwing the latest pot into the huge hole. They would then go back through the studio and get back into their car (i hate cars) and drive to the pottery supply place and buy another box of clay and repeat the cycle with all the pots until they too were cast into the huge pit of their pots that were made purely for the amusement of the artist. Frankly, I will keep making pots that are lovingly referred to by complete strangers as "everyday pottery, that you would just take for granted" hearing that at the festival I was at on Monday made my heart grow two whole sizes. Imagine the perfect mug, whose shape settles into your hand as though made specially for you, the glaze is smooth and pleasant to the tongue and lips and you make tea or coffee each morning for that perfect mug that you bought from some woman at a Market, or the lidded casserole that you bake brie in for girls night at your house, or maybe you have a huge bowl that you make bread in for special occasions, you really didn't have that much money but it has been a beautiful part of your kitchen for years and years. If all I ever make is pleasant pots that really work for people and last for years, I am deeply satisfied, others may happily continue to fill that hole in the backyard while I take your $20 bill to the store and buy more clay to make another pleasant pot. PS Hello to Charlene an artist trapped in a cubicle which pays for her home, welcome to the conversation!